Ah, bottle service (also known as table service) – one of man’s greatest tributes to the pleasures of hedonism. Welcome to the good life – drinking exorbitantly marked up alcohol brought to you by scantily clad bottle girls as you black out and run up the tab – you only live once, right? There is a case to be made for bottle service, however – even for those unwilling to blow a month’s salary on bottle service. In many cases, bottle service can actually be pretty comparatively priced to standard clubbing, with a number of extra benefits. You do not need to have bottle service to get into a club. However, if you want some dedicated real estate and are anxious about getting in, bottle service is definitely the way to go. Almost all clubs these days have VIP tables arranged throughout the club. When you get bottle/table service at a club you are paying the club a premium for bottles, mixers, and table space/real estate. Mixers are pretty standard across most clubs – cranberry, orange juice, tonic water, limes/lemons, etc. If you want energy drinks or bottled water you’ll have to pay extra (but that amount is counted towards your minimum). In addition to bringing out the bottles, bottle service girls also help you make drinks, pour shots, refill your mixers, remove empty glasses, etc. Each table booking has a minimum spend – that is, the amount you need to spend on alcohol (and for dayclubs, food). The minimums that you are quoted never include tax/tip – which you can estimate to be about 30% (~10% tax, 18-20% tip). Gratuity is usually automatically included in the final bill at 18-20%. As such, whenever you book a table you’ll want to multiply the minimum by 1.3 to figure out how much you’ll likely end up spending. A table with 1k min will run you 1.3k, a table with 5k min will run you 6.5k, etc. 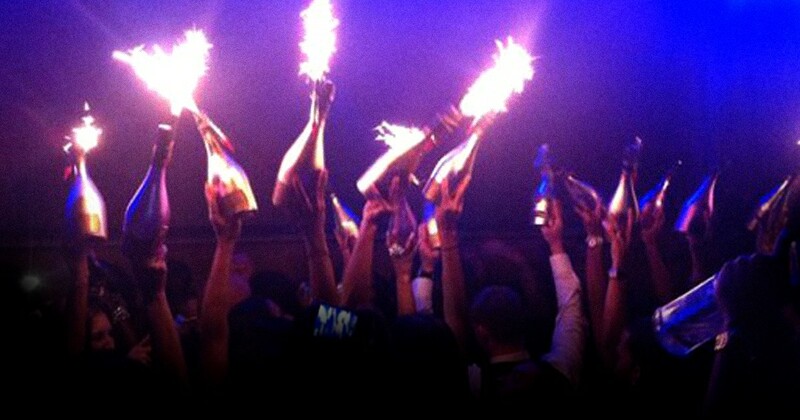 What are the advantages to getting bottle service? In Vegas bachelorette parties can oftentimes get discounted tables – ask us! How much does bottle service cost? Bottle service in Las Vegas will cost you anywhere from 150 per guy to 1000 per guy depending on how much you want to splurge. You can easily run up similar bills in other cities as well, but generally speaking your tabs in Las Vegas will be higher than in other cities, just because the bottles cost more. The same bottle of goose that costs $250 in SF will run you $400 in LA and even up to $650 in Las Vegas. If you have enough guys (or girls willing to pitch in) in your group, bottle service can actually make a lot of sense financially. For example, lets say you have 8 guys and want to go to a top tier club for a top tier DJ. You’re looking at $50 presale tickets or $70 GA at the door plus a tip for the bouncer if you don’t want to wait. Then once you get inside, drinks will run you ~20 per drink/shot. Between buying drinks for your friends and buying drinks for girls, you’ll easily run up a $150-200 tab very quickly. With a bit of planning and foresight you can take that money and book a table – sure, your table isn’t going to be on the dance floor, but you’ll still be able to enjoy most of the benefits listed above at a comparative price. The key to balancing the equation is having enough guys in your group that are willing to throw down. If your group is very girl heavy, the price per guy goes up significantly and it no longer makes financial sense to get a table. How do I book bottle service? In the past you’d have to find a promoter for each club. We’ve built a mobile app to make the whole process easy and streamlined. You can download our free mobile app here. Using the app you can easily see who’s spinning, browse by club, view upcoming events, and book table service with a few taps on your phone. You can also email us (info@discotech.me), call/text us (415-735-6716) or fill out the contact form below. As a general rule of thumb – the earlier you arrive, the better your table location will be. If you have a low minimum (think 1k or less) we recommend that you arrive no later than 11:30 – the low minimum tables are the lowest priority on the totem pole if the club starts filling up. With higher minimums, your table is generally pretty secure but arriving early can definitely still secure a better table position. For an extra handshake / tip, we can also have a host secure a specific table. Let us know what you’re interested in – we’ll do our best to make it happen and make you happy! Yes you have to be 21 for all Vegas clubs. If you’re bringing a fake, better make sure it’s good. Vegas bouncer are pros at detecting fake IDs. If your fake ID is picked up, you can sometimes tip the bouncer (think $200) if you’re getting bottle service. If you’re just in the regular line, it’s probably not going to happen. Each club maintains a dress code and bouncers at the door will not hesitate to turn you down if you’re dressed like a scrub. Check out our guide to Las Vegas Nightlife Dress Code for more information on what to wear. The more money you spend / the more famous you are, the more relaxed the dress code is. Lebron James can roll to the club in a baseball cap and jersey, but unless you’re dropping at least 5k its very unlikely that you’ll get into the club dressed similarly. Do I have to have more girls than guys? Parties of all girls (bachelorette parties) can often times get access to discounted tables. Parties of all guys will sometimes (not often) have higher minimums on busier days. If you have a mixed ratio party, you can keep costs down by getting bottle service for the guys, and getting girls in on presale tickets or free guestlists. Are tables more expensive on holidays? Generally speaking minimums will be higher across the board on holidays. Some clubs also have higher bottle prices on holidays – so you’re paying more per bottle as well. Ask us if you have any questions! Which Vegas clubs have bottle service? We hope this was helpful – don’t hesitate to drop us a line if you have any questions!